After a morning spent shopping for children’s presents at Hakuhinkan Toy Park, Tokyo’s version of Toys’R’Us, Rumi and I were escorted by the shop’s owner to his favorite tempura restaurants a few blocks away. Just off Ginza, in a back alley was an unmarked sliding door which led to my best lunch in Tokyo. One of those memorable meals that magically combines a sense of place with delicious food and hilarious company. Rumi and I entered the simple room with just a seven-seat counter in the center lined by blond wood walls – no decorations or music and no chef. We were offered something to drink by the kimono-clad server – Rumi ordered a cold beer for us to share and this was served with a small plate of cold silken tofu. While we waited to see what would happen, the unsmiling chef came in from the kitchen, nodded his head to us and quietly approached his large bubbling vat of oil carrying with him several bamboo baskets filled with all sorts of seafood and vegetables. He gave us three tiny plates with grated radish, a bit of lemon juice and some fine salt then, the show began. 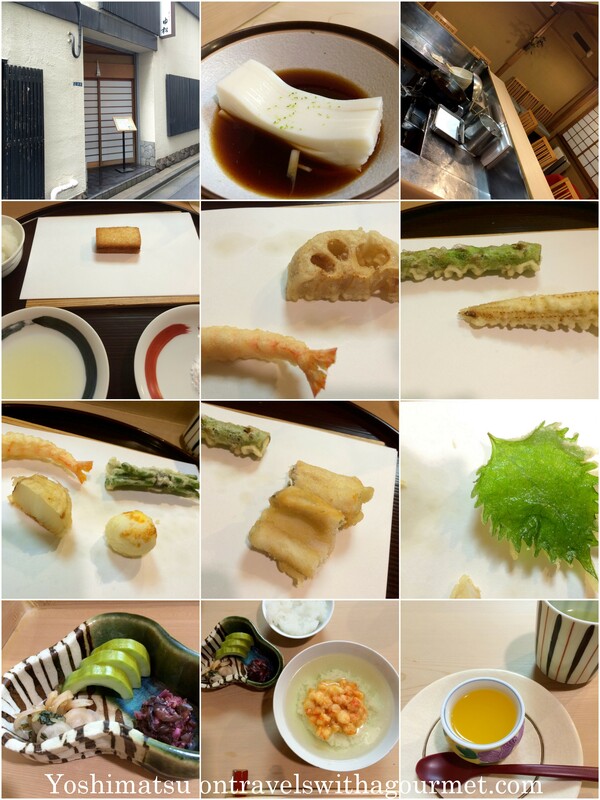 As this was a tempura restaurant, all the food that the chef prepared was first dipped in a light ice-cold batter then deep-fried. First came a single block of soft tofu – hot and silky soft on the inside, crunchy on the outside. As soon as we had gobbled this up, the chef would fry the next morsel: lotus root followed by sweet shrimp, asparagus then young corn and a small bundle of thin green beans. Halfway through the meal, the chef could see the glazed look in our eyes and hear the oohing and aching after every bite and finally, a flicker of a smile finally appeared on his face. Next up was a quail egg, a scallop, some white fish, shiso leaf, several more tiny sweet shrimp and finally a small plate of pickles and served with the traditional last course, a bowl of cooked short-grain rice in which the chef had poured some green tea and topped it with a delicate prawn fritter. By this time, the chef was chatting with us and telling us about how he loves what he does and that although, Michelin wanted to list him, he asked them not to as he wanted to keep his restaurant small and as is and just keep cooking the food he loves to do. Lunch lasted a couple of hours and ended with some lemon jelly and green tea. We left the restaurant with a full belly, smiles on our faces and a hand-wrapped onigiri gift from the chef. Tempura will never taste the same again. That’s what happens when one visits Japan, all the other previous Japanese meals start to pale in comparison.